Denice and Duncan miss their bicycles back home. When the neighbour's grandchildren ride their bicycles on the road outside, Duncan will run alongside and race with them. Or he will push the bike from behind one of them. I bought them these scooters so they can at least ride around the patio and burn off some excess energy. These scooters can be folded and if they are still in good shape by the time we leave, I will pack them in our bags and bring them home! Did you notice the pair of shoes that Duncan is wearing in this picture? He sometimes like to put on Denice's shoes, especially those with heels, and wear them around the house, with Denice screaming after him telling him to take them off! Those shoes actually belong to their older cousin, and they were already a little torn but Denice wanted them so the cousin gave them to her. She loves to hear the clacking sounds the heels make as she walks on the tiled floor. Bugs me, though! This morning I met a Chinese lady and her two kids at the supermarket. I had heard of her from my hairdresser and the owner of a coffe shop near the supermarket. Actually, I had already seen her eating with her children and relatives at another coffee shop one morning. I suspected she was the one my hairdresser told me about, but I didn't feel like butting into a family enjoying their breakfast! The two kids gave her identity away. Who is she? Just another local woman married to an American and home for the summer vacation! I really wanted to get to know her better but she seemed in a hurry. And didn't seem all that interested in getting to know a fellow Sarawakian living in the States! I was quite disappointed. She used to live in California but now lives in New Mexico. Haha...I thot my eyes were playing tricks on me when I saw the shoes Duncan was wearing! Haha, good thing he has no interest in girl clothes! Only shoes! Yea.. i noted that too from the very beginning hehe.. lol!! Duncan love dress up! 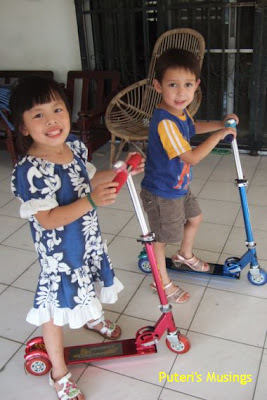 !.that nice of you to buy them the scooter.When we was in KL Mishu wanna to ride bicycle but her home have 2 already,so I'm not going to buy for her.hmmmmm you should get in touch with the lady,mana tau you can visit her in NM next time,right?jadi kawan la. Aww...It really is like raising twins, isn't it? They're both so sweet, and obviously close...Who cares what shoes Duncan is wearing (Denice too) if they're having fun?! ?